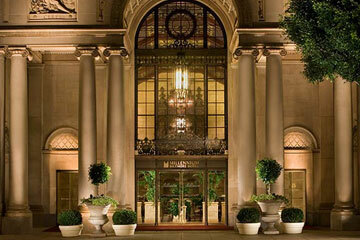 Save on parking near the Millennium Biltmore Hotel Los Angeles. $25 overnight parking is available 7 days a week at the PACMUTUAL garage. On Monday-Fridays, guests must enter after 4 PM and exit by 9 AM the next day. On weekends, guests may stay until 12 PM. The garage can be entered via 539 S Olive Street. The Millennium Biltmore Hotel Los Angeles has been a Hollywood landmark since it opened in 1923. The hotel has hosted a wide variety of celebrities, presidents, and dignitaries, and has been featured in many films and TV shows. Set in the heart of LA's vibrant cultural district, the hotel is within a short distance from popular attractions including Pershing Square, The Broad Museum, Walt Disney Concert Hall, L.A. Live, and the Los Angeles Convention Center.